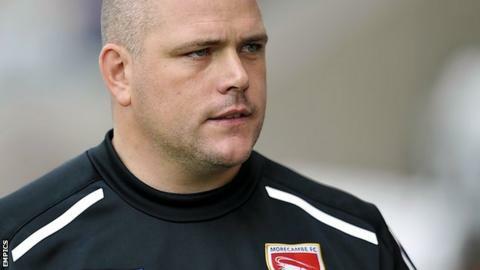 Jim Bentley says this season has been his most testing as Morecambe manager. The Shrimps started well and were ninth at the start of 2014, but only secured their League Two status by winning 3-0 at AFC Wimbledon on Saturday. Bentley, who has been in charge since 2011, told BBC Radio Lancashire: "It's been by far the hardest season. "Certainly over the last three or four weeks, I've been a nightmare to live with. But I'm at the head of the ship and every day I've remained upbeat." Morecambe are in their seventh season as a Football League club. They finished their first three seasons in the top half of the table, reaching the play-offs in 2009-10. Since then, they have failed to finish any higher than 15th. He added: "It was nice that a few of the players said 'that was for you' after Saturday's game. I'll take a lot from it and we'll move on." Morecambe will begin an eighth successive season in League Two in August, and survival has been achieved despite the Lancashire club operating with a reduced playing budget in 2013-14. "It's well documented that we had to make cutbacks," said the 37-year-old. "We were bringing in a few young lads and non-league lads in and you never know what you're going to get. "We've been stretched for bodies because we've had a relatively small squad. Losing our top scorer [Jack Redshaw to a long-term hip injury] in the first pre-season game was a big blow for us. "We've been a bit unlucky with all that, but you can't use it as an excuse."